NMDA receptors are complex electrochemical machines, important for signaling between brain cells. 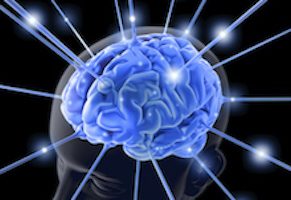 Rare mutations in the corresponding genes cause epilepsy and intellectual disability. Pre-M1 helices in multi-subunit NMDA receptor. Adapted from Ogden et al PLOS Genetics (2017). The study of human genetics has often focused on mutations that cause disease. When it comes to genetic variations in healthy people, scientists knew they were out there, but didn’t have a full picture of their extent. That is changing with the emergence of resources such as the Exome Aggregation Consortium or ExAC, which combines sequences for the protein-coding parts of the genome from more than 60,000 people into a database that continues to expand. Rare mutations in the NMDA receptor genes cause epilepsy (GRIN2A) or intellectual disability (GRIN2B). 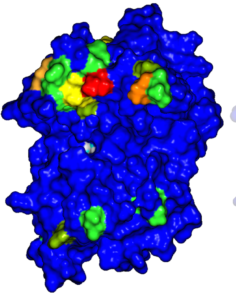 Shown in blue are agonist binding domains of the receptors, where several disease-causing mutations can be found. In addition, the paper provides a detailed look at how 25 mutations that were identified in individuals with neurologic disease actually affect the receptors. For some patients, this insight could potentially guide anticonvulsant treatment with a repurposed Alzheimer’s medication. Also included are three new mutations from patients identified by whole exome sequencing, one in GRIN2A and two in GRIN2B. Heat map of agonist binding domain for GRIN2A. From Swanger et al AJHG (2016). 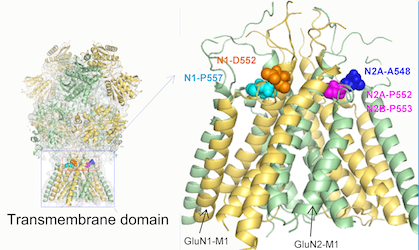 NMDA receptors are complicated machines: mutations can affect how well they bind their ligands (glutamate and glycine), how they open and shut, or how they are processed onto the cell surface. 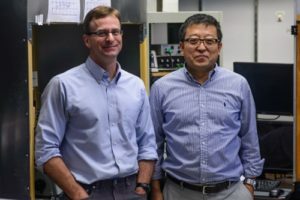 On top of that complexity, mutations that make the receptors either stronger or weaker can both lead the brain into difficulty; within each gene, both types of mutation are associated with similar disorders. With some GRIN2A mutations, the functional changes identified in the lab were quite strong, but the effect on the brain was less dramatic (mild intellectual disability or speech disorder), suggesting that other genetic factors contribute to outcomes. Memantine is an NMDA receptor antagonist, aimed at counteracting the overactivation of the receptor caused by the mutation. Memantine has also been used to treat children with epilepsy associated with mutations in the related GRIN2D gene. However, memantine doesn’t work on all activating mutations, and could have effects on the unmutated NMDA receptors in the brain as well. Traynelis reports that his clinical colleagues are developing guidelines for physicians on the use of memantine for children with GRIN gene mutations. 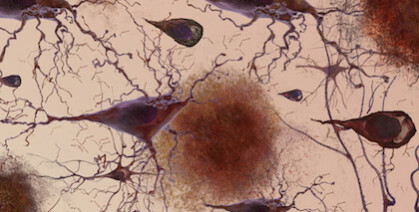 This study and related investigations were supported by funding from the Eunice Kennedy Shriver National Institute of Child Health and Human Development (R01HD082373), the National Institute of Neurological Disorders and Stroke (R24NS092989), the Atlanta Clinical & Translational Science Institute (UL1TR000454), and CURE Epilepsy: Citizens United for Research in Epilepsy.